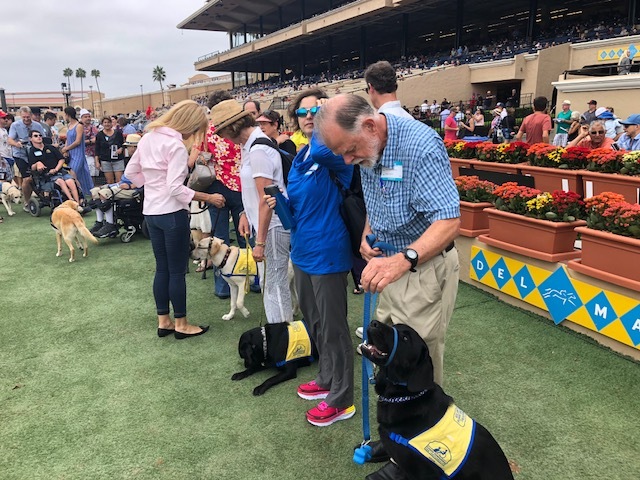 A whole pack of puppies and their accompanying humans descended upon the Del Mar racetrack yesterday (the last day of racing for this summer’s season). Happily, Adagio, Steve, and I and our videographer friends, Alberto Lau and Bob Schneider, were able to join in. The afternoon proved to be a lot less boisterous than one might expect and not at all profitable (that was entirely predictable, given my incompetence at horse-wagering). Still, all the humans had fun. I’m not so sure about Adagio. Compared to sleeping, which is how he spends most afternoons, there was certainly a lot more to smell and see. 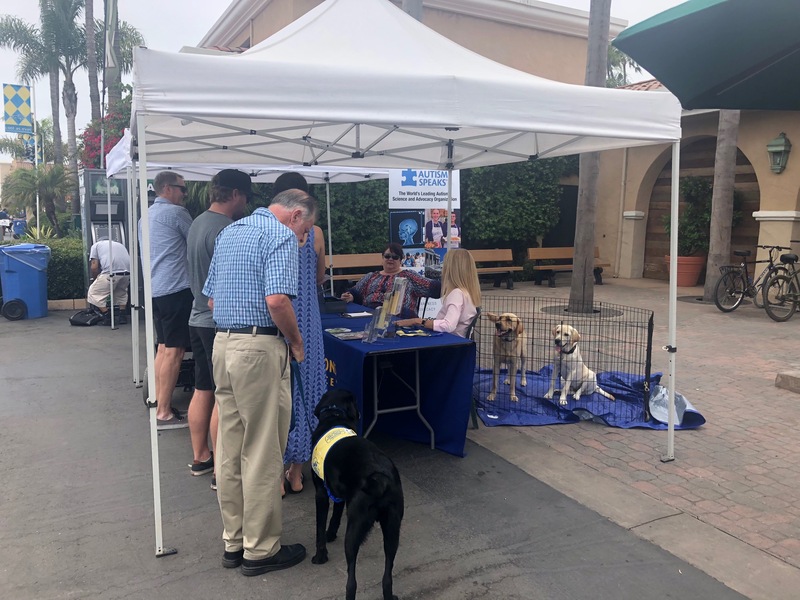 But because this was a semi-official CCI outing, all the pups had to be on their best behavior, sitting and walking on loose leashes and staying in Down positions, rather than romping and wrestling, as they would have all preferred. For the most part, their behavior was impeccable, and they got a lot of admiration from the racing fans. But from the doggy perspective, it wasn’t what you’d call fascinating. His first sight of horses parading around the paddock area did appear to grab Adagio’s attention. Later, the dogs had an opportunity for an even closer equine encounter. 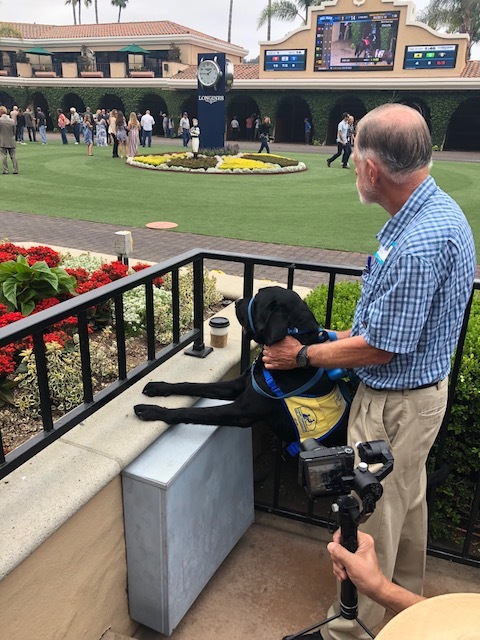 Because one of the veteran CCI puppy-raisers works at the track and arranged for the group experience, the second race saluted the CCI organization. We all got to line up in front of the grandstand and be photographed. And the puppies were allowed to approach some of the track horses for a nose-to-nose encounter. Adagio thought the cute little blonde was MUCH more intriguing than the large brown weird-smelling dogs on the far side of the fence. At only one moment did he do something unexpected. 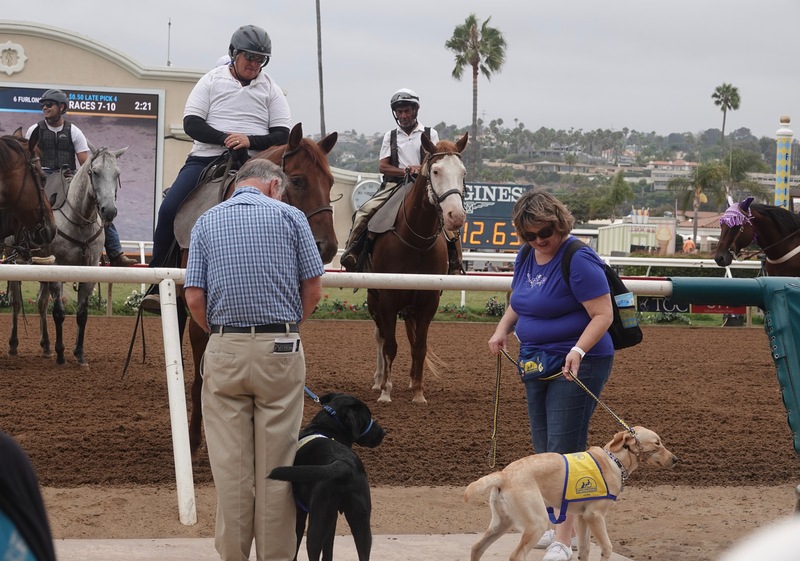 Shortly before the second race, he barked loudly — twice. I took it as a sign that my hunch about the #2 horse should be followed. Ignoring the 60-1 odds, I put $5 on Chocolate Goddess to win. And now I have a tip for you: never take the advice of a dog when betting on the ponies. What a fun event! Having CCI recognized and honored probably introduced many people to the organization.